1 in 8 of the most disadvantaged children in the North East say they don’t have a book of their own at home, according to our new research. We looked at 29,674 school children across the region, aged 8-18, don’t own a book. Of these children, those who receive free school meals, boys of all ages and teenagers are the most likely to say they have no books of their own at home. The research report, Book ownership and reading outcomes, found that children who say they don’t own a single book have much poorer educational outcomes than their book owning peers. Children who say they own a book are 15 times more likely to read above the level expected for their age than their peers who don’t own a book (28.8% vs 1.9%) and are four times less likely to read below the expected level (12.9% vs 48.1%). 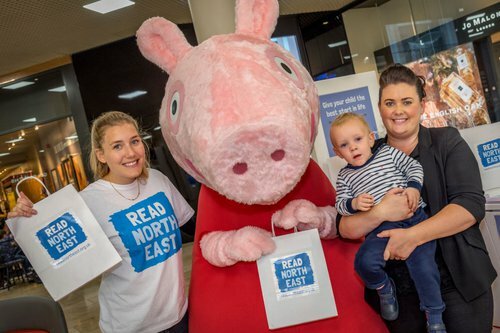 The National Literacy Trust leads the Read North East campaign, in partnership with the North East Literacy Forum. The campaign encourages parents to talk and read to their babies and children every day to support their literacy skills and give them the best start in life. Since launching to the public in October 2017, over 3,000 books have been given away to families at intu Metrocentre, the Riverside Stadium and Stockton Sparkles, which we generously donated by campaign partner Penguin Random House. In 2018, more books will be gifted to the children and families who need them the most. The report was released to launch the charity’s Christmas Stories campaign, which aims to give some of the UK’s most disadvantaged children their very first book this Christmas. Find out more about Read North East.